[Solved] How to Fix “Your PC ran into a problem and needs to restart”? Is your Windows PC/Laptop showing blue screen error saying that “Your PC ran into a problem and needs restart”? ‘Your PC ran into a problem and needs to restart’. We’re just collecting some error info, and then we’ll restart for you. If YES then you need to get rid of this error as soon as possible, if you ignore this BSoD error then it can affect the entire computer and make your system inaccessible. This error generally appears when a user tries to run a heavy game on their PC/Laptop OR try to install any software and more. This BSoD error usually triggers because of the several issues, some of the common causes are system driver confliction issue, damaged hardware, infected system files, corrupt registry keys or overheating issue. As we know that when the “Your PC ran into a problem and needs to restart. We’re just collecting some error info, and then we’ll restart for you… (100% complete)” error message appears the computer becomes unresponsive and after the percentage reached to 100% then the system reboots automatically or get stuck. Now coming to the solution, here in this blog, you will learn several possible solutions to get rid of ‘Your PC Ran into Problem and Needs to Restart’ Error. All the below-discussed solutions are completely tested, so by applying them you can easily fix this error and prevent your PC from these types of issues in the feature. Simply follow them carefully, and this troubleshooting guide will instruct you to fix the “PC Ran Into a Problem and Needs To Restart” error/problem in Windows 10, Windows 8 or Windows 8.1 OS. 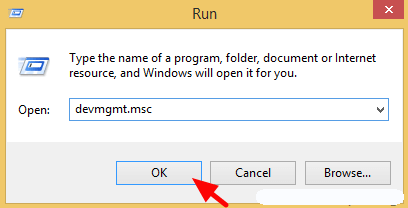 Open the run dialogue box by pressing “Windows” + “R” keys. 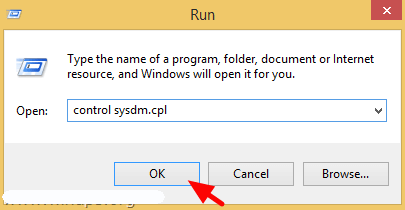 In the run dialogue box, you need to type the “control sysdm.cpl” and hit ‘Enter’ key. Now, at the Advanced tab click on the “Start-up and Recovery” Settings. 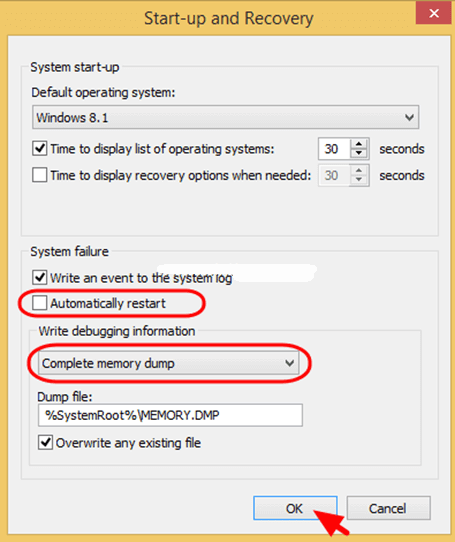 Unmark the Automatically Restart check box, after it, click on the drop-down arrow and set the “Write debugging information” to Complete memory dump. At last press, OK to save the changes and reboot your PC/Laptop. After it, run your PC/Laptop and make sure that the error is fixed or not. It is already found that “Your PC ran into a problem and needs to restart” error can be triggered because of the outdated or not working system driver. So in this fix, we will try to update the system drivers. After booting your Windows system into safe mode, if “Your PC ran into a problem and needs to restart” error doesn’t appear then it is confirmed that the software or a hardware device driver are the culprits. First of all remove the installed Antivirus Software completely. Perform a clean boot and search for the service or apps generating the problem. Now, you need to uninstall and then re-install some of the important system drivers. 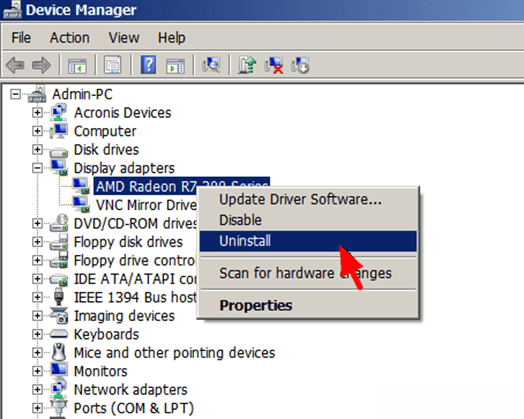 Try to uninstall the below-given drivers, restart your PC after uninstalling each of them. In the run box, type devmgmt.msc and hit Enter key to open the Device Manager. At the device manager, click on the Display Adapters to expand its options. Now right-click on the installed Video adapter and choose Uninstall. After the completion of un-installation process Restart your PC/Laptop. Now, you need to install the latest driver, visit the official website of your hardware manufacturer webpage and download the available driver for your system. Again, reboot your computer and check for the “Your PC ran into a problem and needs to restart” error. Note: Use the same steps to uninstall other system drivers. First of all you need to open the command prompt with admin privilege. 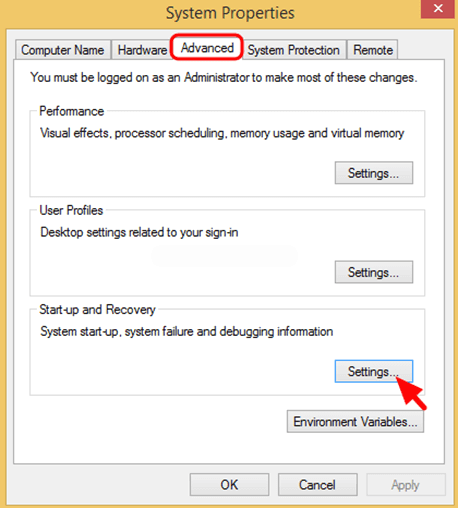 To do this, press the Win key + X hotkey and choose Command Prompt (Admin). After opening the command prompt, you need to run the SFC command. To do this, type sfc /scannow in the Command Prompt window and hit ENTER key to run this command. The SFC command will scan the entire system files and fix the corrupted system files. Once the SFC command gets completed reboot your system, and check for the error message. This command will verify your hard disk for any kind of errors, so it will take a long period of time to complete. In the run box, type MdSched.exe and hit Enter key. This process will try to fix your system’s memory related errors if you do it perfectly. At last, reboot your PC and make sure that it is running normally OR you are able to access all of your stored stuffs without BSoD error. That’s all about “Your PC ran into a problem and needs to restart” error and its solutions. It is hoped that all the above-discussed solutions will help you and your PC/Laptop become normal. Now after fixing this issue, it is recommended to scan your PC with a professional PC Error Repair Tool. This is the software which will help your PC/Laptop to deal with all types of internal issues like DLL errors, system bug issues, registry error and more. This software will also help you to deal with the slow PC performance, simply download – install and run this software. This will make your PC error-free and fast, so it is suggested to use this software for once.